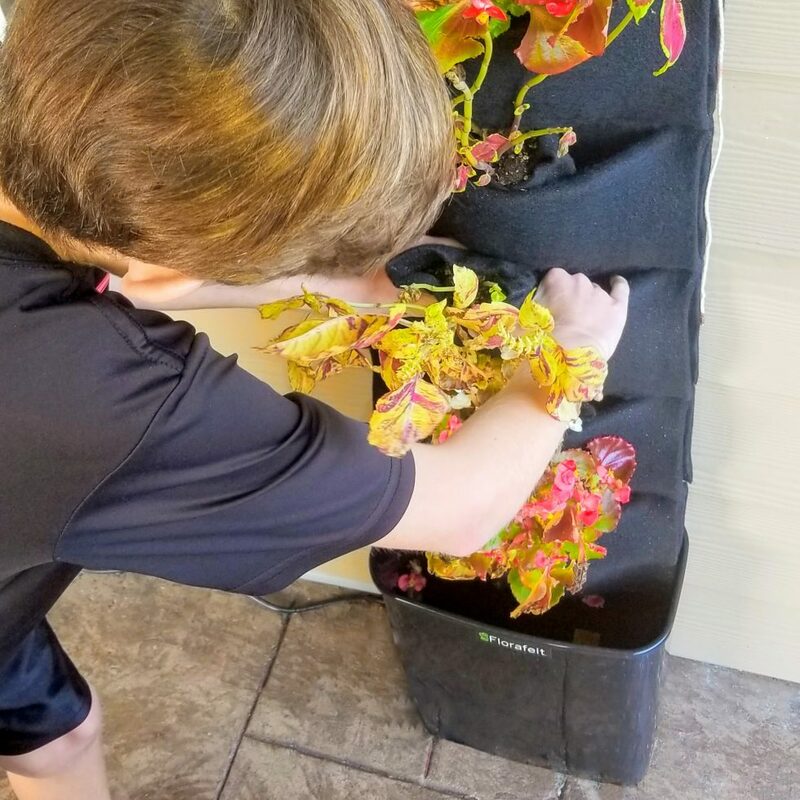 By a sunny, inside window or on your patio, you and your kids can explore a whole new way to garden. Pick out the coolest plants, wrap them up and put them in the pockets. Bundle an exciting bunch in the same pocket and throw in some seeds. You can even use cuttings or other plants in the yard. Try anything and have fun. The Florafelt Compact Kit is a fun and easy way to learn about plants. Wrap each plant neatly and slip into the soft felt pockets. Kids love to learn about plants and watch the roots grow into the felt. It’s a hands-on way to understand gardening, and glimpse the future of growing food. 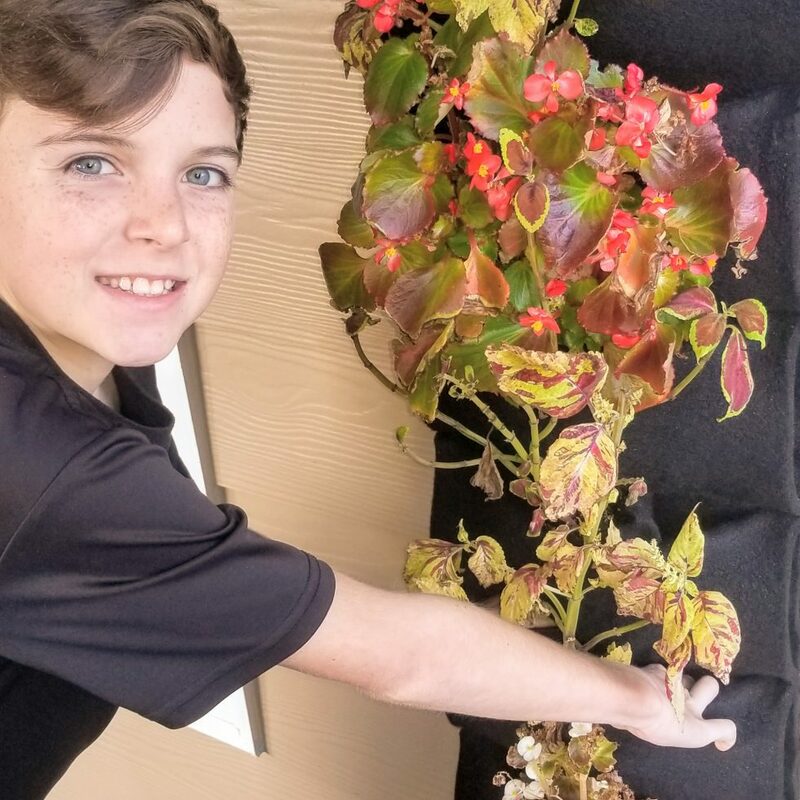 With a little practice, your family will become plant wall masters. Pick your favorite plants, wrap the roots, then slip them into the pockets. 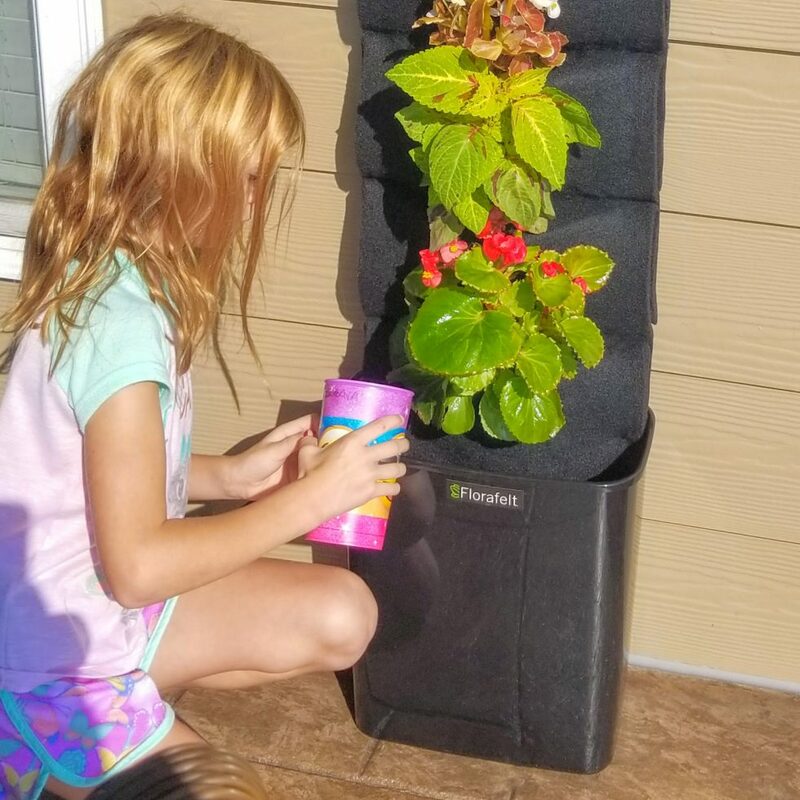 Your Florafelt vertical garden waters automatically with a pump and timer. Just top off the tank every now and then, and the pump waters your vertical garden from the top. The excess drains into the tank and recirculates for sustainable gardening. Custom loose fibers let the roots breathe for easy growth, and it’s fun to watch the roots dig into the felt. A timer activates the pump each day for 30 minutes, so you’ll never forget to water. Plants love it, too. Plant walls are a great way for kids to learn about the future of gardening. A happy plant bursts with beautiful colors, and your family will be rewarded with a vibrant, flowering display. Any plant can grow in Florafelt Pockets, so try something new. Use different combinations and change it up when you learn what thrives in your lighting and environment. At the end of season, remove the plants, shake out the wraps and store for next year. It’s a fun family project. Hanging tabs let you mount Florafelt Pocket Panels anywhere. 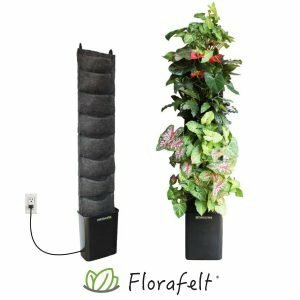 The Florafelt Compact Vertical Garden Kit is affordable and fun and can be used over and over. Unfold the panel and hang from the included mounting hooks. Fill the tank with water then plug in the timer. Use the provided felt squares to wrap your plants, stretch open the pockets and insert into your plants. Try your favorite plants and even start from seeds. 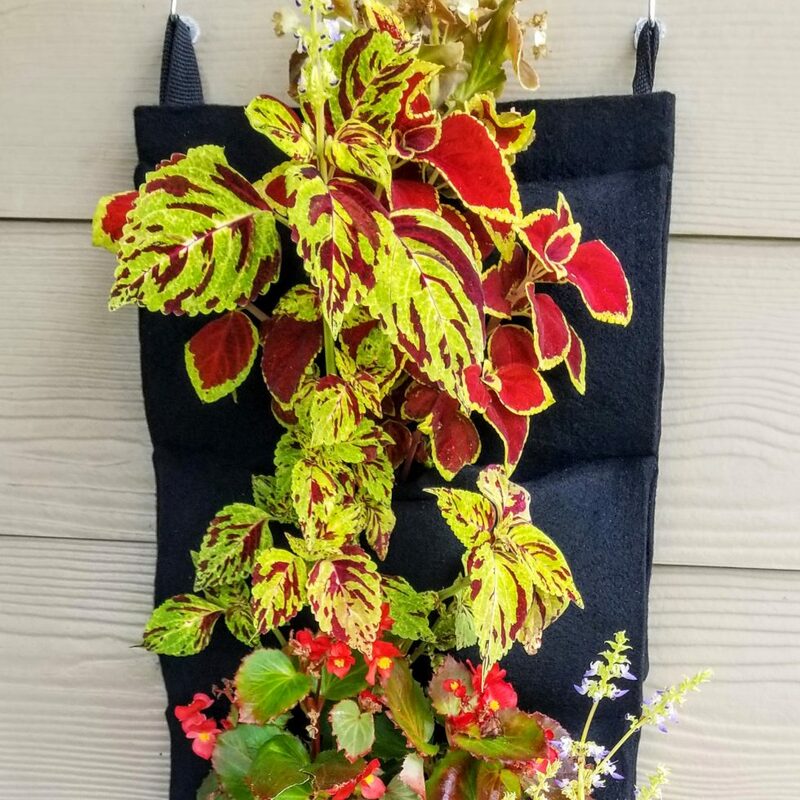 It’s an easy way to learn about vertical gardening.